Sinchi Tribe, pllek & Cineblend present the Dutch premiere of Small Island Big Song. A unique cinematic experience coming from Asia / the Pacific islands. across the islands of Asia, Pacific and Indian Oceans through song, story and homeland. 3 years in the making, the result of these travels is over 9tbs of cinematic footage & multi-tracked music, from 16 countries, featuring over 100 first nation musicians filmed and recorded in nature, weaved together into 18 collaborative songs; an Oceanic Songline. The dream started two and half years ago and was to address current environmental issues and to strenghten indigenous knowledge in the region. The result is a powerful, organic and authentic piece of art, recoinnecting a region, which shares a common heritage, originating from Taiwan over 5,000 years ago. In a freestyle Cine Performance, Tim will DJ & VJ the music and visuals together in a multi-screen journey. 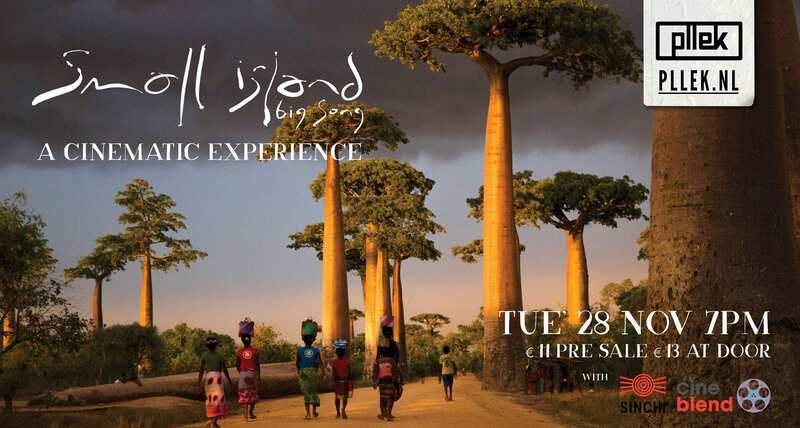 Pulling together music from 50 recording sessions woven into 18 songs, mixed live, whilst visually showcasing the musicians’ playing in nature in their communities; the unique landscapes of these little known island nations come to life before your eyes. 21:15 – 21:30 Q&A with Small Island Big Song, led by Eddy Appels from Cineblend. 21:30 – 22:00 Time for some music and dancing to the sounds of Austronesian island culture. Cineblend: Annual documentary festival Cineblend focuses on cultural diversity and representation of cultures around the world, challenging western stereotypes. Cineblend positions itself at the crossroad of visual anthropolgy, documentary filmmaking and politics. Sinchi Tribe: Sinchi is a non-profit, focusing on the preservation of indigenous culture and upholding the UN’s declaration on the rights of Indigenous Peoples (UNDRIP).